Christoph F. Blumhardt was an evangelical theologian in the former Kingdom of Wuerttemberg in Germany, a vicar and writer of hymns, in later life also a representative of the Social Democrats in the Wuerttemberg Parliament. He is considered the founding father of the Religious-Socialist Movement in Switzerland and in Germany. His father, Johann Christoph Blumhardt, was a vicar too, a personality living the traditions of Pietism and anticipating the powerful intervention of the Holy Spirit in everyday life. He was known nationwide for the miraculous healing of a woman who had been considered incurable. In 1852 he purchased the health resort of Bad Boll. He was buried on the cemetery there, as was his son Christoph Friedrich, who had become his successor as a spiritual leader in Bad Boll. 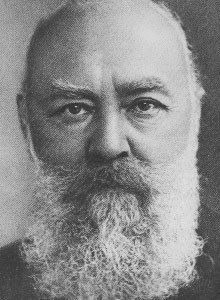 Christoph F. Blumhardt counts among the important theologians of modern Protestantism for three reasons: firstly, at an early stage he was already able to point out the limits of the capitalist economic system as well as the destruction of the environment in its wake. Secondly, in a time when the world community was increasingly growing together he gave Christianity a vast broadness, thus opening the doors to the necessary interreligious discourse. Finally, by acknowledging the working class, which was not a matter of course at the time, he discovered their important role for a civil society. The combination of spiritual depth and socio-political commitment could be a model for our time, as well as for the Church of Wuerttemberg. The treasure of his insights has not been raised yet.